Zanna is keen to be involved in educational work and passionately believes in a creative approach to learning and inspiring anyone who wants to play. Contact her to discuss. Zanna is keen to be involved in educational work and passionately believes in a creative approach to learning and inspiring anyone who wants to play. Zanna enjoys private teaching across the ages, from children to adults. She is happy to take on keen students of any age and ability. Currently she teaches in students homes and brings energy and passion to the lessons, building good relationships with her pupils and sharing her love of music and the harp. 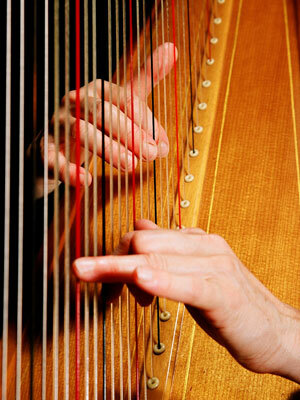 Learning the harp does require time enthusiasm discipline and patience. It is not an easy technique but worth getting it right at the beginning! It is helpful for new students to be able to already read music, but she can teach basic theory and also teach combining the importance of playing by ear as well as reading music. Zanna is also an arts practitioner and draws on her years of experience working in primary schools. As an arts practitioner, Zanna has worked for ARTIS for 5 years delivering workshops and weekly lessons combining music, drama and dance in primary schools. Occasionally she takes the folk harp into sessions to demonstrate its versatility, fun and bring magic to the sessions. This has recently led to using the folk harp alongside other trained musicians to deliver workshops for babies and toddlers, including Little London Music School.